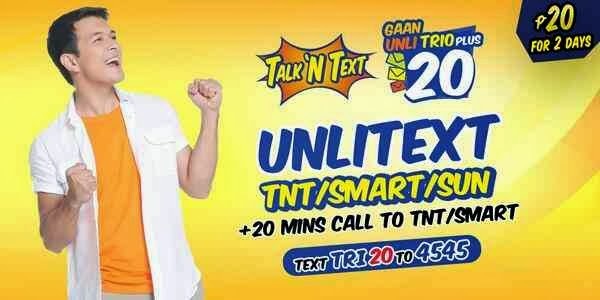 Text never stop on one whole day as Talk N Text offer their latest unlimited text promo this 2014 that gives TRINET unli texting to Smart, Sun Cellular and TNT subscribers. For only 20 pesos you can fully enjoy this services that last for two days non-stop SMS texting plus 20 minutes of call. Try this out, just visit your nearest load retailer and convert your load to TRIO20 by sending the key code provided below. Registration is as simple as counting 123, keywords used is not complicated and easier to memorize. Just remember the word trio, with that you can automatically recall this TRINET promo. You can also Gaan Unli TRIO TRI15 for only 15 pesos valid only for 24 hours, or check out list of all available Talk N Text promos. Remember not text to Globe or TM as it will cost you normal SMS rate and deduct your current regular load balance. How to call or dial Gaan Unli Trio TRI20? To TRIO20 and TRI15 call, just dial *4545 plus the 11 digit Smart/TNT number of the person that you are trying to call. That’s it, for updates just visit TNT website and see flyers for more details.